Ralph Baierlein, a professor in the Department of Physics and Astronomy at Northern Arizona University, believes that it is past time to address some common misconceptions about special relativity, and clear the air about an assumption that has been credited to famous physicist and theorist Albert Einstein. Basically, the theory of special relativity addresses perceptions experienced in different frames of reference. For example, two observers in one frame of reference might agree that events at two separate locations took place at the same time. Even if the events took place in locations far apart, it is still possible to agree on the simultaneity of the events when observers are in the same frame of reference. However, someone in a different frame of reference would typically observe a different time interval. Perhaps the third observer, in a reference frame moving even at a snail’s pace difference, would say that the two events took place ten minutes apart, rather than at the same time. The observations made are relative to the particular frame of reference that one is in. The first misconception Baierlein addresses is the idea that as the difference in the relative speed of reference frames decreases, it is possible to cancel out the idea of perceptual relativity. Many are taught that if the difference in the speed of the reference frames is small enough, then whether or not two events happen at the same time no longer becomes a matter of perceptual difference. But, as his American Journal of Physics article indicates, it doesn’t matter how small the ratio of velocity to the speed of light. As long as the ratio is not zero, simultaneity is relative, and our third observer will typically never view the two events as taking place at exactly the same time. Baierlein’s second point concerns the speed of light. The problem with the current idea of “the constancy of the speed of light” stems from a misunderstanding of the way the phrase was used in Einstein’s day and the way it is used now. “Very often the assumption is made that a given burst of light will have the same speed in all frames of reference.” While this is true with regard to how the phrase is viewed today, in Einstein’s day the phrase meant something different. 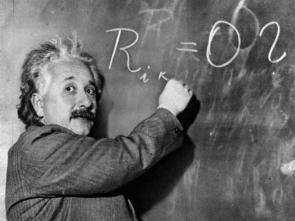 Baierlein’s piece points out that when Einstein was working on the theory of special relativity, the phrase “the constancy of the speed of light” meant that the velocity at which a light source is moving has no bearing on the speed of the light that emanates from the source. The speed of light is constant, regardless of how fast or slow its source happens to be moving. The implausible assumption is that the speed of light remains perceptually constant, regardless of the frame of reference or the speed of that reference frame. Baierlein compares it to having a laser in a lab, and having two observers moving at different speeds. “Say you are in a lab,” he says, “and you point a laser and you measure the speed of the light emitted by it. If I’m moving away from your lab at half the speed of light, I’ll get the same numerical value you do, even though I am running away at the speed I am.” This is counterintuitive to most ideas of how measurements work. However, it is true of measuring light. In many current textbooks, however, the assumption is simply made that all uniformly moving observers measure the same speed of light. On top of that, the authors imply that Einstein made that assumption. While Baierlein’s article doesn’t change the fact that light measurements in such cases would be the same, it does propose a way to get back to Einstein’s original postulates and teach relativity in a manner that makes more sense.